Radiation oncologist Dr. Andrea McKee believes deaths from lung cancer — including those related to asbestos exposure — could be reduced significantly by increased utilization of early CT screening. McKee, chair of radiation oncology at Lahey Hospital and Medical Center in Burlington, Maine, has been a strong proponent of early screening for several years. Unfortunately, fewer than 5 percent of the estimated 9 million Americans who meet the recommended criteria for annual screening actually undergo the procedure, according to the American Lung Association. The organization also estimates 160,000 people in the United States will die in 2018 from lung cancer — the world’s leading cancer killer — eclipsing the combined totals of colon, breast and prostate cancers. The death toll in November, which is Lung Cancer Awareness Month, will be more than 13,000 within the United States. Exposure to asbestos is most often associated with causing mesothelioma, but it also can cause several other cancers, including lung cancer. Early screening — before obvious symptoms — often leads to early detection when lung cancer is much more treatable. “If you pick up lung cancer early, and it’s not that difficult to do [with early screening], you can treat it surgically, and you are essentially curing the patient,” said Dr. Farid Gharagozloo, thoracic surgeon at Florida Hospital Celebration Health. In most cases, though, symptoms only become obvious after the cancer has progressed to an advanced stage, leading to a five-year survival rate of less than 4 percent. When lung cancer is uncovered in its earliest stage — which is only 15 percent of those diagnosed — there is a five-year survival rate of more than 60 percent. 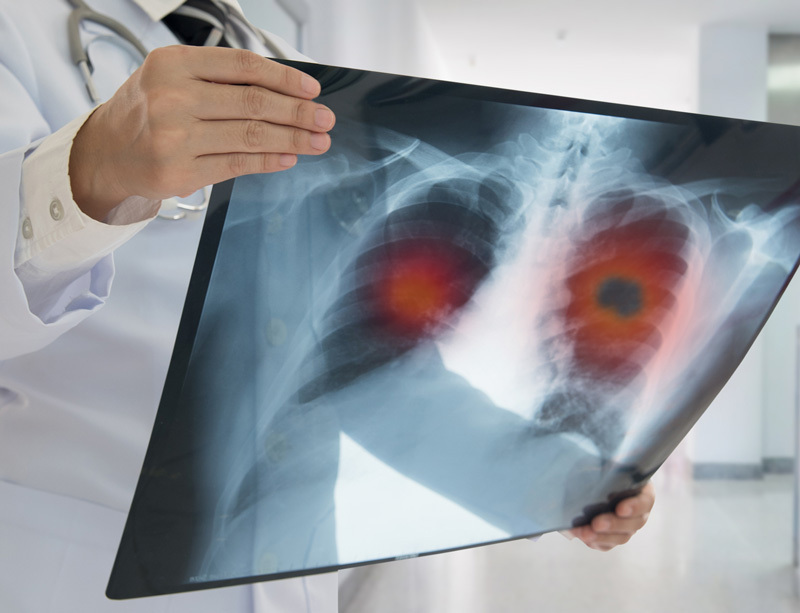 The pros and cons of early screening for lung cancer have been debated for decades, but it gained considerable momentum in 2011 with a National Lung Screening Trial that demonstrated a 20 percent lower mortality rate for high-risk individuals. The most recent study, presented earlier this year at the World Conference on Lung Cancer in Toronto, demonstrated a 26 percent drop in mortality rates for high-risk men and a 61 percent drop for high-risk women. McKee has been vocal in her beliefs about early screening because she has seen the effectiveness firsthand. The Lahey Hospital and Medical Center was the first U.S. facility to be designated an accredited Lung Cancer Screening Center by the American College of Radiology. The Rescue Lung, Rescue Life Program at Lahey has screened more than 5,000 high-risk individuals since 2012, which McKee believes is 70 percent of the area’s high-risk patients. Lung cancer has been detected close to 200 times, and 85 percent of those have been early stage and very treatable. Screening is done with a low-dose CT scan which creates detailed pictures of the lung that are reviewed by clinicians who look for early signs of lung cancer. Small abnormal areas, called nodules, sometimes will need a closer look, and more testing, but often they are not cancerous. McKee said the false-positive rate, which often fueled the anti-scan debate in the past, has dropped to 7 to 8 percent. She also said the scans use 10 times less radiation than typical scans. The American Lung Association recommends annual scans for anyone in the “high-risk” category. The criteria for high risk of lung cancer would include anyone 55 to 80 years of age who smoked at least one pack of cigarettes a day for 30 years, or two packs a day for 15 years. They may still smoke or have quit within the last 15 years. Although smoking has declined significantly in recent years, lung cancer deaths have remained steady and even risen in some years, magnifying the belief that the causes of lung cancer have expanded. Smoking or exposure to second-hand smoke is believed to be responsible for 85 percent of lung cancer cases, but exposure to toxic asbestos significantly increases the risk. One recent study demonstrated that occupational asbestos exposure on its own created a five-times-higher risk of developing lung cancer. The combination of smoking and asbestos exposure created a mortality rate that was 28 times higher than average. The National Cancer Care Alliance, a network of independent oncology practices across the United States, added asbestos exposure to its criteria for early-screening recommendations. McKee is among many in the medical field who are encouraging an expansion of early screening and lobbying the Center for Medicare and Medicaid Services. They would like to expand the high-risk group to include current and former smokers over 50 who smoked one pack of cigarettes per day for 20 years, and had another risk factor, such as repeated asbestos exposure. She would like to see a more aggressive promotion of early screening throughout the medical community. Patients need to be more insistent. Doctors need to be supportive. McKee believes they could duplicate the success oncologists have had with breast and prostate cancer, where death rates dropped significantly — primarily because of early detection. By comparison, 70 percent of women eligible for breast-cancer screening have undergone a mammogram in the past two years. Lung cancer has only 5 percent early-screening participation. “We’re going to get there, but in the meantime, too many others are going to die,” she said. McKee, A. (2018, November 24). Save lives by increasing lung cancer screenings.